Deferring income makes a lot of sense—especially during the years where income is quite stable or high. However, it is also true that income deferral (and therefore tax deferral) is the wrong strategy at other times. For many wealthy and retired clients, a tax-deferral strategy can result in getting clobbered with higher taxes down the road, at higher tax rates than you would have otherwise paid today. So, what if you could realize income now (in order to pay a smaller tax) instead of realizing it later and (paying a larger tax)? If you have to realize this income at some point anyway, would you rather realize it now at a lower tax rate, or later at a much higher tax rate? This multi-year tax planning is called Tax Smoothing and it can build wealth by saving money on taxes. Currently, there are seven tax brackets. – 10%, 15%, 25%, 28%, 33%, 35%, and 39.6%. As your income rises, it fills the lower brackets and then moves to the next higher bracket. For example, for married clients the first $18,000 of taxable income is taxed at 10%, the next $55,000 is taxed at the 15% tax rate, etc. With a tax smoothing strategy, you would avoid/defer income out of the higher tax brackets and accelerate it into the lower tax brackets. However, this is not done on just an annual basis. The biggest benefits are realized when tax smoothing evaluates your anticipated tax rates over time as illustrated in the table below. Looking at tax rates this way is especially useful during the years where there is much variability in income (and therefore tax rates). 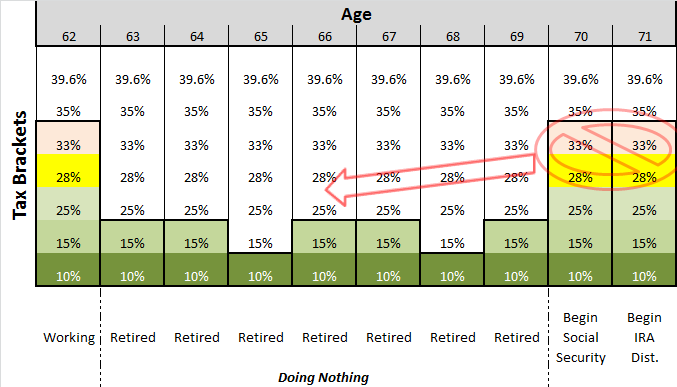 Generally these variable years occur between the time of employment and age 70. When there is a lot of variability of income, there is a lot of opportunity for tax planning and tax savings. 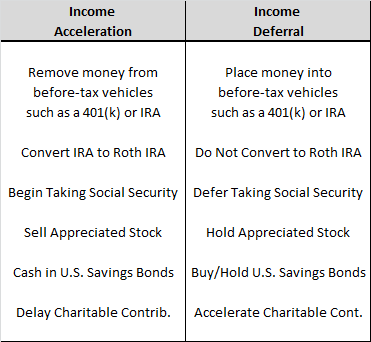 To take advantage of tax smoothing, you must know which acceleration and deferral techniques fit with your own projection of taxable income and future tax brackets. Even more so, you much know which tax brackets to maximize. 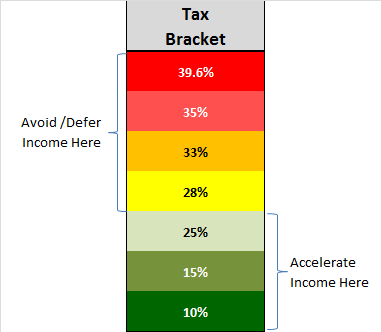 Some clients should maximize the 15% tax bracket, while others should maximize the 25% tax bracket. Take a moment to study the chart above. Notice how “bumpy” it is. It is bumpy because this client’s income is changing quite dramatically. Think of tax brackets as buckets you may want to consciously fill with income in order to take advantage of low rates now. Then you don’t have to face them as severely in the future. Low brackets are something you USE—not celebrate!! The original length version of this article was published in the October 2015 edition of the Mallard Flyer which can be accessed at this link: Build Wealth by Paying Taxes.